Blue Devils and Regiment tied each other for 4th place at the 1990 DCI World Championships in Rich Stadium, just outside Buffalo, N.Y., a show won by the Cadets of Bergen County, with the Cavaliers in 2nd place and Star of Indiana making it into the top-three for the first time. This meant that 1990 became the first year in DCI's history that there was no California corps in either of the top-two positions. The Cadet's winning show offered the corps' trademark "Z-pull" drill formation, except instead of completing the maneuver; it reversed and went back to where it started. Blue Devils, playing the Who's "Tommy," left behind 15 years of jazz programs to explore the world of rock. Spirit of Atlanta, after years of exploring music about Georgia, went straight for their hometown with "Gone With the Wind" and Star of Indiana's "Belshazzar's Feast" sparkled both musically and visually. Phantom Regiment's "Dreams of Desire" was based entirely on the music of Camille Saint-Sa?«ns, the over-achieving French Romantic era composer who wrote his first musical composition at the age of three. The corps' production started quietly with an anticipation of the grand finale of "Symphony No. 3" (often referred to as the "Organ Symphony"), written in 1886 at the age of 51 and was dedicated to his good friend and mentor Franz Lizst, who had recently died. Despite the title, the organ is not a primary solo feature of the piece, but simply another instrumental color. Just shy of a minute into the show, the finale hit on all cylinders with the different voices of the horn line hitting massive chords, conveying the power of a pipe organ that in a concert hall makes the walls rumble. This theme, which was prominently featured in the hit film about a heroic farm pig, "Babe," is easily one of the most majestic musical works ever conceived, perfectly made for the revved-up power of Phantom Regiment's horn line. At the very end, the color guard pulled out 12 large golden triangular banners and ran toward the far reaches of the field. The next part of the show was devoted to two movements from the 14-movement "Carnival of the Animals," also written by Saint-Sa?«ns in 1886. The work wasn't published until 1922, five months after the composer's death, as he had specified it was not to be published during his lifetime, fearing its light and humorous nature might make critics think of him as a composer who was too playful to be taken seriously. A lone color guard member paraded up front with a tall pole upon which trailed several red streamers in sort of a circus tent shape, introducing the movement, "The Elephant." Amusingly, Saint-Sa?«ns took themes written for high-pitched instruments by Mendelssohn and Berlioz and moved the melodies to the string bass, a very low-pitched instrument, to convey the slow plodding of an elephant. Phantom Regiment's designers took the melody and gave it back to high-pitched instruments, the introduction played on mallet keyboards in the front ensemble. This was followed by a short rendition of "Fossils," movement 12, which originally featured xylophone. Just as Saint-Sa?«ns had fun with the music, so did the corps, using the work to pay tribute to a number of its competitors. Among just a few of the tidbits was a brief snippet of Santa Clara Vanguard's 1989 "Phantom of the Opera" theme and a quite unmistakable proclamation of Madison Scouts' fanfare to "Slaughter on Tenth Avenue" which won the corps a World Championship title in 1975. Then the tubas came in and played the melody just as Saint-Sa?«ns had written it for string bass, followed by a block of red flags that seemed quite reminiscent of the Cavaliers' large silks in the corps' 1983 "Pines of Rome" production. In "Finale," Saint-Sa?«ns quoted from Tchaikovsky's "Dance of the Little Swans" from "Swan Lake," heard in the percussion, with the horn line's red capes complementing the red flags. The corps' closer of "Bacchanale" (from "Sampson and Delilah") was first written by Saint-Sa?«ns as an oratorio in 1867 and expanded into an opera nine years later. This movement captured the reckless revelry that preceded the destruction of the Philistine temple by Sampson. "Sampson and Delilah" is the only opera out of Saint-Sa?«ns' seven such works that is still regularly performed. 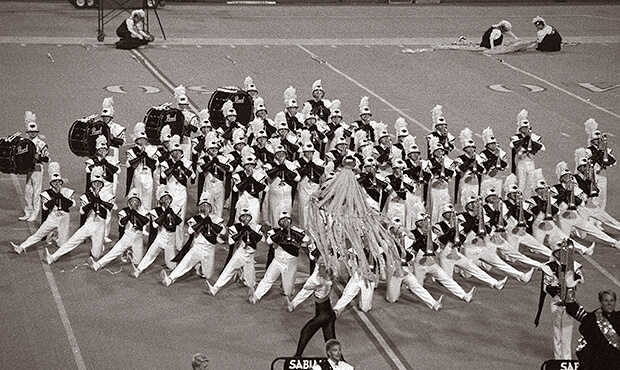 1990 was the first of two consecutive years that Phantom Regiment utilized the work as its closer. After an introduction that gave no indication of the brutal musical spectacle that was to follow, a brief glimpse of Saint-Sa?«ns' "Danse Macabre" led into an interlude of the Philistine priests and priestesses softly singing while preparing their feast of celebration over the power of Sampson, now held prisoner in their dungeon. When the "Bachannale" kicked into high gear, four members of the front ensemble rhythmically pounded tall jingle sticks on the ground to announce the arrival of the no-holds-barred party. The field filled with yellow banners as a huge silk of many regal colors soared behind the brass. In the stands, the corps' fans tossed streamers into the air, creating a complementary visual. For this week only, you can save on the Legacy Collection DVD that contains this complete Phantom Regiment performance, along with all finalists from the 1990 DCI World Championships. Discount DVD offer ends Monday, Dec. 2 at 8:30 a.m. ET.